nailhed: Beaver Archipelago, Pt. 9: "The Danish Coast"
I took one look back at Kee's place, and resumed my rushed eastward hike along the shore to get back to the trail. I did feel much more rested and ready to tackle a few more miles of rough hiking. It was now about 3:30pm. Was this perhaps a mide lodge used in the healing Midewiwin ceremony? Wood lay stacked nearby, and some ashes remained in the pit. Larger black stones had been taken to form what I guessed to be a windbreak around it. As I kept walking, I noticed that this was not the only one. I was surrounded in similar firepits and arcs of black stones, all interspersed amongst the cedar trees at the verge of the forest. There were maybe up to 20 in all, strung out in a meandering line all down the shore, some close together, some more secluded. They must have had some pretty big gatherings up here? Very curious. I had stumbled into the private world of a completely different culture; had I remained on the designated trail, I would never have come across any of these things I had seen. These rotted planks belonged to a small structure with a peaked roof, perhaps a shed, and just through the trees I could tell that a clearing lay not far beyond. This must finally be the Vincent place, marked on the MAP as the "Boatbuilder's Clearing." Finally, I could pick up a trail again and get back on track. I was getting more nervous about my chances of getting back to Northcutt by 10am. If I couldn't find a usable trail leading from here, I would be forced to walk all the way back around the island via the beach…which would take forever. 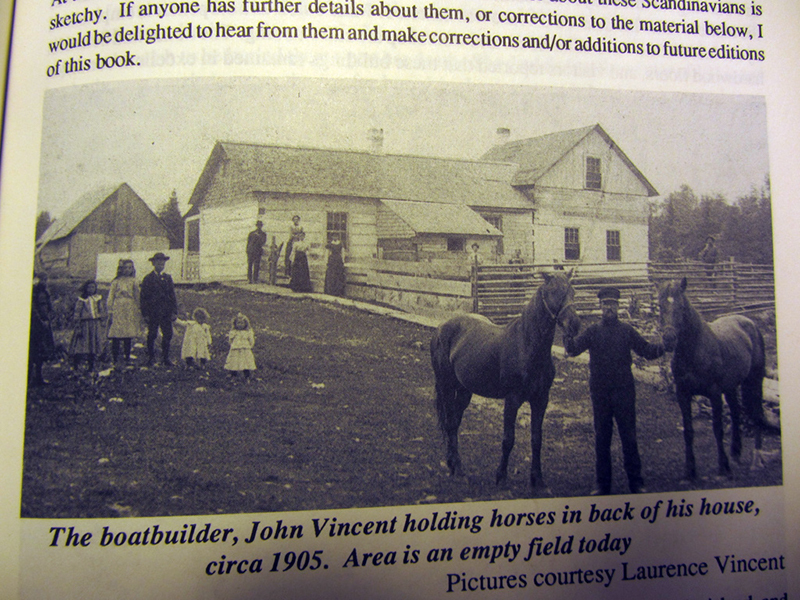 John Vincent was probably the first white man to successfully homestead on this island year-round. 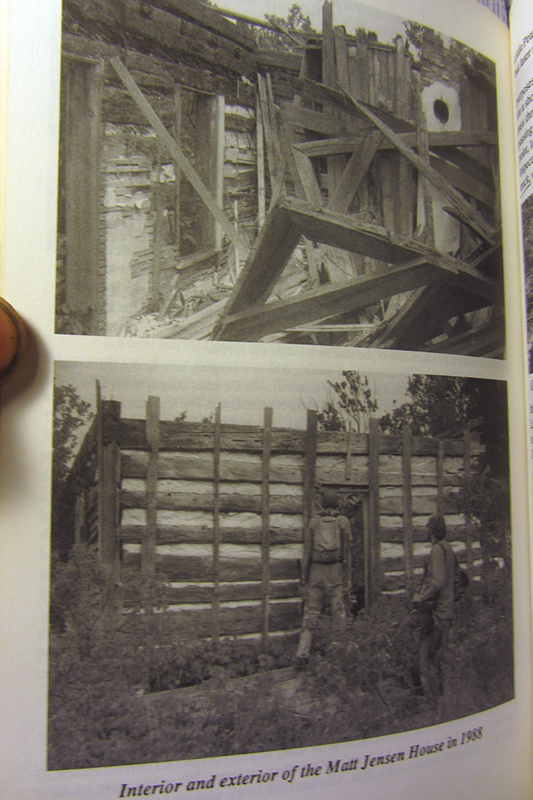 He was skilled both as a farmer and a lumberman, but more importantly as a carpenter. Born in southern Michigan he moved north, following the lumber camps as they cleared the virgin tracts, until he met his wife in Naubinway, a small village on the shore of the Upper Peninsula directly north of Garden Island. The Vincents came to the island to homestead and raise a family of 12, but John soon realized that being situated in the middle of the richest fishing waters of the Great Lakes his carpentry skills could pay off even more handsomely due to the high demand for fishing boats. His son Henry was reputed to have been an even more skilled carpenter than his father and the boats they constructed were soon highly sought after, earning them a legendary reputation as master boatbuilders. John Vincent passed away around 1910 however, and the family enterprise he stood at the helm of began to dissolve. Henry continued building boats for a few years, but by 1915 his brother John Jr. was the only remaining Vincent still on the island. I began to find pieces of debris, but if I recalled correctly from Ruchhoft's writings there should not be any ruins left of the Vincent house. Somewhere around here was also a cemetery for the white settlers of the northern shore of the island, but I never found it. This curious iron piece was stamped, "Glazier Stove Co.--Chelsea, Michigan, USA"…whose factory I had explored a few years prior. Suddenly I began to find structures. Not just one, but a few. Was I really at Boatbuilder's Clearing, or was I at the "Dane's Farm"…? This ruin looked more like Ruchhoft's picture of the Jensen homestead. The point marked "Dane's Farm" was another homestead clearing on this shore, so named because it was one of the several farms established by Danish immigrants in the 1800s. Ruchhoft's information on the Danish settlers of Garden Island is admittedly a little sketchy, and his book contains some contradictions as to who lived on what farm. But the main families who lived here were the Larsens, Jensens, and Nielsens. All the Danes had known each other before coming to the island, either by blood or marriage. The first family to arrive reported back that the terrain and climate were very similar to their island homes back in Denmark, and encouraged the rest of the clan to follow. Okay, so if this wasn't the Vincents' place, it had to be the Larsens' or Jensens'. Which means I was further down the shore than I thought…? Ruchhoft suggests that the original DNR map of Garden Island erroneously mixes up the "Boatbuilder's Clearing" and "Dane's Farm" locations because the cemetery by the Vincents' home contained predominantly Danish headstones, confusing the mapmaker. So I am still unsure as to which is correct. I had explored and photographed the ruins of this house more hurriedly than I would have liked, and was now eating my second-to-last apple while beginning the search for the trailhead that lead back to the Schoolhouse Trail I had lost. I was curious as to how this would turn out. In the back of my head I kept wondering whether I'd have any better luck following it this time or if I would end up lost again. I didn't see anything immediately, and as I circled the entire clearing once I still didn't find anything obvious. Okay, a second time, this time looking more closely. I still didn't really see anything that really resembled a real trail, or filled me with much confidence. This was starting to really piss me off. I eventually noticed the profile of yet another ruined structure, and moved toward it to investigate. I snapped a few pics in a rush, before discovering what looked like a possible trailhead leading to the south. I followed it for several yards, but it was quite faint and I lost it after a minute. I backtracked, picked it up again and tried a second time. This time I was able to follow it so I poured on the speed. But within a few minutes it petered out into nothingness again, without a trace to be seen anywhere. I couldn't believe this...what the hell? It was as if the manitous were toying with me, resentful of my presence on their island and leading me astray in the woods, doomed to be forever lost, and my skeleton swallowed by the forest never again to be seen by human eyes. One of the stories Ruchhoft relates about the Danish inhabitants of Garden Island illustrates just how harsh and lonely life here must have been, especially the endless grueling winters. Matt Jensen was a stalwart lover of his island home, though his wife was a little less enthusiastic about it. One of the ways he made money was by cutting timber for railroad ties and fenceposts, and hauling it to Beaver Island for sale. On each trip his wife Lena would try to convince him to winter on the much more commodious Beaver Island, but the diehard Matt always refused. His brother Peter Jensen left for good to join the Lighthouse Service, and by the 1920s Matt and Lena were the only remaining white homesteaders still living on Garden year-round. Lena died during one of those bitter, solitary winters in the early 1930s. Matt wanted to take her to Beaver for burial, but had no way of transporting her remains across the channel by himself. Not wanting to share his house with a corpse for the entire winter, he built a giant bonfire on the beach at the southern end of the island to try and signal aid from Beaver Island. He had to keep the fire burning for three straight days before someone saw it and came to investigate. Matt died alone in his cabin, which Ruchhoft says still stood in 1988. I now sat down and recalculated my options again. It was getting late…I no longer had time to explore--I had to start back on some path to Northcutt immediately. Apparently the beach was not as expedient an alternative to the woods as I had hoped. It looked like if I followed every curvature of the island's jagged coast that it could add up to as much as 10 or 12 miles…and if it's taking me an hour and a half to go a mile, then it would take a minimum of 15 hours to reach Northcutt--leaving only about three hours for sleep or rest. I figured since it was about 5pm now, with as fatigued as I would become by hiking nonstop all night, I would only barely make it to the rendezvous by noon tomorrow at best--two hours late. By then Captain Bonadeo will have probably called the Charlevoix County Sheriff to form a search party, maybe even the Coast Guard. Big trouble. On the other hand, if I cut a straight-line path with my compass through the center of the island I would soon pass the buffer zone of fallen evergreens, hit the smooth sailing of the inland hardwoods, and only have to cover a distance of about two or three miles at most. Clearly this was the better option. I didn't feel 100% confident with this option either, but regardless of obstacles, it is always easier to hike three miles than it is to hike 12 miles. Even if my course was off a little I would pop out in the general vicinity of Northcutt, which was essentially directly south of where I was now. I had to trust my compass and take the plunge. I dove headlong through the brush with my compass in hand, checking it every few seconds to ensure I was following a straight path. Almost immediately I began to encounter swamp. It was easy enough to get around, but now I was no longer following a straight line, I was wandering back and forth in a wildly deviating course, adding all kinds of distance onto my journey. I began to become stifled by the impenetrable woods I found myself in…unable to see more than a few feet or recognize any landmarks, and the only view of the sky being straight up overhead, it felt very much like navigating an unfamiliar room in the dark or with a blindfold. Your morale goes down when faced with this level of uncertainty, even though your compass needle may point true. The woods can be very intimidating, especially on such a long bushwhack. Soon it would be dark and I would be forced to sleep out here in this stifling thicket without a sleeping bag. I began to think about the beach again. Coming out into these swampier areas was better, because at least then I could see more than two feet. But after a few really messy log crossings and only increasing swampiness ahead, I finally stopped and deliberated whether to give up on this course, in great exasperation at my predicament. Ruefully I realized that if I had just decided to use the beach earlier I would already be quite a ways down the road by now. But now I had to backtrack all of the rough, ugly terrain I had just fought through for the past 30 minutes or so. God dammit. I was sweating and panting. I had been wondering for some time now what Captain Bonadeo would do if he arrived on shore to find no one present. I have a feeling he would wait at least one hour to see if I show up late before calling authorities. In a worst-case scenario I figured there was a solid chance that searchers would begin by making a circle of the island by boat to see if they can spot me; it would make it a hell of a lot easier for them to find me, and for me to be able to signal them, than making them comb the whole damn 5,000-acre woods. It was sounding like I was going to miss the 10am deadline regardless of which choice I made, so taking the shoreline was starting to look like the smarter of the two options again. One fact remained clear: if I stuck to the woods, I could not predict what obstacles I might encounter. I might get so deep into a swamp I can't find my way to backtrack around it. Actually, I didn't really know much for certain about the interior of the island except for the parts I had personally walked through…for all I knew, this part might be all swamp and none of the oak openings I was hoping for. I turned back. I found myself popping back out of the exact same bush of the homestead clearing's treeline as I had dove into an hour ago when I began this bushwhack. Pretty impressive--I had done the same thing once before at Captain Daniel's Hill last fall with Navi. At least I knew my compass headings were legit. Now I had the choice of which direction to follow the beach--clockwise around the island, or go back counter-clockwise from where I had come. Looking at my map I now began to question again whether I was really at the site marked "Dane's Farm," or whether I had merely only reached the one marked "Boatbuilder's Clearing." I had definitely not passed more than one clearly evident farmstead clearing, so I decided that I was in fact still at the Vincents'. In that case heading counter-clockwise back the way I came seemed to be the smarter option. That way I was treading on familiar ground at least. Due to the fact that I had planned this as a quick day-trip and left my heavy sleeping bag back at the DNR station, only bringing my wool blanket in case of emergency, and because the temperature was likely going to be near freezing again tonight, I knew that I pretty much had to stay at Kee's place. I didn't like the idea of invading like that, but I was totally and utterly exhausted from all the fighting I had done today, and without a proper sleeping bag in this weather I would not be getting much rest for the intense hike that awaited tomorrow. After an easy march back to Kee's place, I returned to that haven of whispering boughs and drops of dancing golden sunlight playing over the ground as if it were some close relative's place that I had only recently visited. I plopped my burden down under the pavilion, and sat exhaustedly on the bench swing to let my sweaty self dry off in the gentle breeze. The weather was now absolutely sublime--the perfect temperature, not too humid, the sounds of rolling surf not far off, and the warming glow of more steeply-angled light rays than before knifing their way down through the cedars. Once more I let the calming peace of this place repair my fatigued spirit as I munched sparingly on dinner, knowing that this warmth would not last much longer. I really hoped that I wouldn't have to make my remaining rations stretch into any more than one more meal. Then again, if I chow them all down now I won't have to carry them, and they will give me more energy for the marathon tomorrow. Actually, in just a few hours, to be exact. On that note, it was time to set my alarm. I uncorked the last bit of whiskey and sipped it while becoming nostalgic as I always do when I find myself so, so far from civilization. Allow me to divert you on a lengthy but fascinating sidebar. Though I said John Vincent the boat builder was the first successful white man to live year-round on Minis Gitigaan, he was not the first white man to come here. In the mid-1800s Catholic missionaries of course visited the island at times during their rounds of the Great Lakes, but it was a Scotsman named James Moray (or Murray) who was the first to live here, though quite by accident. He was shipwrecked on nearby Whiskey Island and was rescued by Anishinaabe residents of Garden Island, and they brought him to Minis Gitigaan. He decided to stay here to live, and actually married a woman of their tribe, eventually producing a son. According to Ruchhoft, James Moray was held in high esteem by the natives there because of his extensive knowledge of improved agricultural methods. Not only that but he was savvy with the white traders of Beaver Island, with whom the Indians had been trading for goods. He helped them get better prices for their goods, and avoid the scams that were commonly used on "red men." After ten years of life on Minis Gitigaan, James Moray got word that his father had fallen terminally ill back in Scotland, and left immediately to see him before he expired. This is where things begin to get strange. While on the voyage to Scotland, James fell victim to a fatal plague himself, and died on the ship before arriving in his homeland. Ironically, his father began to recover from his ailment even as his son perished. Returning to full health, James' father took delivery of his son's body in Scotland, and was informed that he now had a half-Indian grandson back in Michigan. The elder Moray then sent a full uniform kilt made of their clan tartan back to Garden Island, as a gift for the child. It was this kilted half-Ojibwe, Ruchhoft writes, who became the grandfather of Kee. She was born around 1919. Her full name was Keewaydinoquay Pakawakuk Peschel. She was a scholar, ethnobotanist, herbalist, medicine woman, teacher, author, and Anishinaabe Elder of the Crane Clan. The story of her birth is just as strange and mystical as the story of her great-grandfather's death. Kee was born in a fishing boat enroute from the Manitou Islands to the nearest hospital when a storm blew up, capsizing their boat. Somehow the newborn infant Kee survived, and this was thought by some to be nothing short of a miracle. Another tale of her youth involved how she earned her childhood name, "Walks With Bears." While out picking blueberries one day, her parents returned to find her happily cavorting with a couple bears, and eating berries with them straight off the bush. Her adult name, Keewaydinoquay, or "Woman of the Northwest Wind," came to her while on her vision quest. As early as nine years of age she apprenticed with the revered medicine woman Nodjimahkwe, to learn the traditional healing arts of her Anishinaabe culture at a time when many of her people had little or no access to "conventional" medical care, and often curing those deemed terminally ill when doctors and hospitals failed to improve their health. At age 57 Kee entered Wayne State University in Detroit to study anthropology, figuring that people would listen to her wisdom more if she had a degree. She got her Masters in Education there, and a PhD from University of Michigan. She taught classes at University of Wisconsin in ethnobotany, and philosophy of Great Lakes American Indian culture in the 1980s, lecturing at conferences on herbalism as well. She was both consulted in the books of others, and authored several of her own on herbs and native medicine and lore. Kee founded a nonprofit called the Miniss Kitigan Drum, supporting Great Lakes native culture and traditions--who, as I would later find out, were the very people who kept up this cabin and used it for retreats. Many referred to her lovingly as "Nookomis," which means "grandmother," though she was also considered controversial by many elders who criticized her for revealing teachings to those of other than Anishinaabe heredity. Her defense was that "the time is late, and that people of good hearts and like minds need to work together to offset the users and those that were actively hurting the earth" [paraphrase], eventually turning most of her critics to her side. When Kee died in 1999, a trust was established to compile a study of her life story by collecting her journals, audio tapes, research, letters, drawings, poetry, and oral teachings into a volume to both immortalize and disseminate to others the vast body of wisdom she possessed on philosophy and herbalism. Many of the rare herbs she studied grew here on Minis Gitigaan, and it was apparent that many of the structures I saw scattered around her cabin were undoubtedly greenhouses where she cultivated and experimented with various groups of plants. I didn't know any of this at the time, but clearly this was a great woman whose life left a great impact on everyone she came into contact with, and upon the island she called her "Heart's Home." I didn't know it, but I could somewhat sense it; truly great people have that power to leave a massive wake that continues even after they have departed. It was now time for me to retire for the night, even though the sun was not quite down. I would have to wake up again at 4am, so it was imperative I tried to sleep as soon as possible. I entered Kee's cabin once again by untying the cord on the knob, and even though I had already been in here once before, I was still just fascinated by all the various things that had been packed in here. I now spent a little more time less bashfully investigating the items I found here, and reading some of the many notes or verses that had been scrawled on everything. While processing these photos, I noticed that on the wall behind the lamp is a nice detailed topographical map of…Garden Island. Perhaps if I had noticed it then, I would have been able to study it and better figure out the actual positions where I had been. "Nika"? Who is that? A relative of Kee's? Clearly other people have been here using the place since her passing. "Tahnahgah?" Is that the Ojibwe word for "chair"? I had no idea. Luckily, thanks to the magic of the internet, I now know the answer. Tahnahgah Yako Meyers is a Mohawk / Taino woman who--like Kee--is a widely known and well respected herbalist. Tahnahgah apprenticed for 23 years under Kee, who brought her into the Anishinaabeg traditions. The Mohawk (Iroquois) and the Ojibwe (Anishinaabeg) are--traditionally speaking--enemy tribes, a bitter rivalry that goes back to ancient times and is so deep-seated that it even continues at least cursorily today, and that is part of the reason why the Anishinaabe elders criticized Kee for sharing their teachings too freely. Remember, Ojibwe / Anishinaabe is a spoken language, not a written one, meaning that the definitions of the words are held in their pronunciation, not their spelling, hence the alternate spelling "Miniss Kitigan." Here on the shelf we see "Insect Repellant & Mise Candles," "Birthday Supplies," "Mijimiiwig Map," "Extra Tubes for H2O Filter," "Spare Diaphragm For Lake Pump," several apparently repurposed Jaegermeister bottles with unknown contents, "Parafin," "Matches," "Candles," and a couple jars with Ojibwe words on them that are too hazy to read, except for the word "mshkiki," which means "medicine." I soon satisfied myself of nosing around other people's possessions and rolled out my blanket on the crude foam mattress laying atop Kee's wooden cot, and got ready for bed. All my gear was left in a state of readiness to be speedily packed up in the dark when I woke back up, so that I could hit the trail with as little delay as possible. I laid down and took the fistful of change out of my pocket to reduce the weight I was carrying, and to offer some form of compensation for my use of this shelter. I still felt quite funny about being here, like Goldilocks and the Three Bears...I was still nervous that whatever current owner or guardian of this cabin might suddenly return while I was asleep. As I tried to slowly drift off, my thoughts wandered quite a bit, and I tried to imagine life here as it was for the old medicine woman who was named after the wind that was gently blowing in the boughs arching over the roof, and swinging outside the ancient window next to my head. Whether or not the manitous of this sacred island had mischievously waylaid my travels earlier, I definitely felt that whatever spirit was watching over this portion of the island was benevolent. As the sun dipped down and Minis Gitigaan was bathed in inky blackness, I sank into sleep, though intermittently waking throughout the night because of my nervousness about getting up again in time to begin my marathon. I did not know what hour it was, but at one point when I stirred I could hear what I could only guess was the sound of Lansing Shoal Light's fog signal, letting out its long, low, automated moan like a metronome, calling across the desolate waters some miles to the north every few seconds. What a lonely, melancholy place to live. You would really have to have some spiritual fortitude to live here year-round and cope with this utter solitude. I felt even more alone than I did on Isle Royale.